If you live in a warm climate, it's important that you have a backup plan to keep your chinchillas cool in case your A/C unit fails. We keep a couple of frozen jugs of water in the freezer during the summer months. So far, doing so has come in very handy. Remember the blackout that hit the Northeast? On that day we had nighttime temperatures in the 90's. It was also very humid. This is the kind of weather that can kill a chinchilla, and with no power, we had no A/C. Too keep our chinchillas cool, I moved them into a small cage we have. I did this so that they couldn't run around. I then placed one of the frozen jugs of water on top of a cookie sheet, both of which I placed on top of the cage. I used a cookie sheet to catch the condensation from the bottle so that the chinchillas wouldn't get wet. Using a thermometer I was able to determine that the temperature in the cage below that frozen jug of water was around 80 degrees. That was a whole 10 degrees lower than the rest of the house. Put ice cubes in your chinchilla's water bottle. Put ice cubes in a dish for your chinchilla to chew and lick. Drape damp (cold water), not dripping wet, towels on the cage. Freeze empty food tins and place in the cage. Make sure there are no sharp edges. Plastic is a never for their cage, they like to chew on everything, so its best to have a metal cage and keep chinchilla safe toys for them to chew on and play with. There are a few types of woods and grass they are allowed to chew on. I just got mine, so I can't think of what chinchilla safe edibles are of hand. No fruits or veges, they cant have sugar either. I just googled their chinchillas safe menu online lol I dont know if Petsmart or PetsCo is available everywhere, but their small animal section was pretty extensive and all their products were labeled for chinchillas or not. I have been wanting a chinchilla for a while now and have been doing massive amounts of research. I know the temperature can't be above 75F so I bought a portable ac unit for in my bedroom. My house is always hot during the summer months so the ac would constantly be on, so my question is, would the loud constant noise bother the chinchilla? Is it safe to use an air conditioner constantly when the weather is warm? Do they have to be in air conditioning? Is it safe to use plastic in the cage? Yes you need to have the air conditioner on, and it is safe. Yes they have to keep below 76 degrees. and NO never use a plastic cage I have a chinchilla mansion which is perfect. It is safe! I use it, but it is also very important to keep emergency chinchilla coolers (marble ledges you may find in pet stores,) just in case you can't use the air conditioner while you are away. If you do not have one of these and no air conditioning, there is still a solution; get a towel,( preferebly a bright color like white so it doesn't attract heat,) and get it damp-NOT DRIPPING, with cold water. lay it on the top of their cage. Or simply get a bag of frozen vegetables or even an ice pack, and set your chinchilla on it. Is it alright to go on holida. And leave a chinchilla in The house if your friend comes round to feed and give it a dust bath? I'm getting a chinchilla but I have a dog and 3 cats. I know 2 of my cats will never give any harm to a chinchilla they never harmed a fly. But my dog could scare the chinchilla and my 3rd cat catches every bird or rodent in sight. He doesn't always kill it he's just a very active cat that was found in the wild catching things is an instict. I was thinking of putting the chinchilla in the basement but the basement could flood and the washing machine/dryer is to loud any suggestions where I could keep the chinchilla but still give it no harm. Dust - Yes, you can purchase the dust, i purchase mine online. My chinchilla gets a bath every other day because it's a bit warmer in my area. There is nothing better than an AC in warm areas to keep the temperature constant. I'm planning on getting a chinchilla. I live in England. I don't have A/C and it's very expensive to get it over here. Is there a better alternative that can be used at all times? You have to figure out the average mean temp of your house. I have had a chinchilla and he did fine in a house with no a/c. What I did was buy stone marble and freeze it. I put one in his cage every 12 hours, during the hot months. Mr Chinch would sit on it and rub his face then forget about it mostly. Chinch's are from the mountains so they like it on the cold side. If it's hot and humid increase their dust baths to mabye daily. The chinchilla coat will adjust to the heat, I noticed a marked decline in fur during the summer. In the winter it would get thicker. There's a lot to cover so we think the best idea is to read the home page of this site which lays out several links to articles in a logical (hopefully) order. Also, if you have a specific question, try using our search box with one or two words. We use Google for the search functionality so if the topic is covered, it'll show up in the results. 1. How often do I change the cage? 2. What do I feed them? 3. Should I give him treats? 4. How much exercise should I give them in that plastic ball? 5. Can I purchase the dust for their bath and how often should I bathe them. There are more questions I have but I would just like to know some of the basics to caring for them. I would hate to have something happen to them while I have them. You change their cage once a week or before if it has been soiled. You feed them chinchilla pellets no mixes. Chinchillas can have treats, however some treats are highly dangerous in big amounts. I use chins2shop.com for all of my treats. They should never ever go in a plastic ball for exercise. This damages their backs and could cause other illnesses. They are best to be put in a safe environment to roam and jump and play in. They need to be able to jump about and play with each other and you. Yes, I get blue cloud dust off of Amazon or any chinchilla dust from a pet store is fine. I give my chinchilla a dust bath once a day or once every other day. Today I cleaned my chinchilla's cage. While I did so I put him in a plastic ball to hold him and let him roll around. It was really warm out, and a little in our home. When I was finished cleaning I went to retrieve him from the ball and found him laying on his side. I never liked that ball and since I've had it (for approx. 7 mo.) I had only put him it it once. I felt there just wasn't proper ventilation to it. Anyway he just seemed lethargic and could hardly stand up. It is now 9 pm and at least he is standing up and puts up a little resistance when I try to pick him up. But...he hasn't eaten a thing, and still is seeming to want to stay only in one place. The only reason I haven't called a vet is because it is Sunday. From what anyone out there knows, do you feel he will snap out of it? I do plan on calling a vet tomorrow. Hopefully it isn't too late. Thanks for listening I have been in tears all day. I feel like a total jerk. I just purchased from walgreens a lunch pack where the outside lining has ice cubes. It's made out of non toxic, puncture resistant material. What I do is put it in the freezer put the frozen cubes in the cage. My chinchilla likes it and has rested on it. The only con is that when it melts, some moisture does seep out but not enough to get the chinchilla wet. I am hoping this is a good idea on hot days. I am thinking about getting a chinchilla soon and I was wondering something. I am going to place the cage in my room since it is the least disturbed part of the house and I like the noise at night, but my room is not always cool in the summer and I can't afford an air conditioner. We have a window one in another part of the house and I was wondering if I left my door open to allow the air in and put a fan on if the chinchilla would be alright? My house barely ever gets to 80 F but it has before. Sounds like a good idea to us! I was wondering if it's ok for my chinchilla if the dust bath is cooled in the refrigerator before placing it in his cage. When I did it, he twirled more vigorously then usual and seemed to enjoy the cold dust. An air conditioner is the only real option. Fans, cold bricks, and other similar techniques won't cut it as they're only temporary solutions. 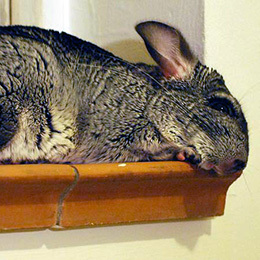 A window air conditioner is a good option if you have your chinchillas in a separate room. I've had my chinchilla for three years and he had never gotten sick until the spring of 2007 if its this hot in spring, summer will be worse. How can I keep him cool through the summer? A fan to circulate air is OK. Just don't point it directly on your chinchillas. Please note that a fan doesn't actually cool the air. If it's 80 degrees without a fan it will still be 80 degrees with a fan. Since chinchillas don't sweat, there's a lot less benefit to using one than there is for people. You need to get an air conditioner for your home or at least for the room where your chinchillas are housed. Now that the weather is getting warm in my area in New Jersey, I was wondering if putting a small fan around the cage to circulate the air is ok. I understand that drafts are harmful but I don't think it's the same situation. I am already prepared with the stone tablet in the cage. Thanks for the tips. It will help. A healthy chinchilla should be alert and energetic. One that is over heating is lethargic and may be lying on its side. Needless to say, you should resist the temptation to buy a chinchilla that doesn't appear healthy unless you have the resources necessary for such rescue efforts. I was wondering how do I tell if the Chinchilla I am getting is over heated? Every web site I went to has something different and I don't know which one is true. I trust that I can get the right knowledge from Chinchilla Planet because you really own a chinchilla. I have 2 chinchillas and we had to move back and forth between two houses with them for the duration of a month. the chinchillas handled the stress well, given that the both of them had lots of outside play time and extra dust baths to reduce stress. Before the bouncing back and forth, they came with us across the country in a carrier with the a/c car unit on. Besides being curious about the new hotel bathrooms, they were allowed to play each night on the road trip. They handled this well. I found that by always placing the carrier in the same spot, with the same toys and food, they understood that their things were in the same place if not in the same room. They loved exploring the new nooks and corners. I was initially really worried about traveling with them since everyone will tell you it's not recommended, but after having to move with them, I know they are much more adaptable then people give them credit for. After the chinchilla bites he goes back to squirming or he tries to jump. I know we are not holding him too tight or he is not over heated because we don't hold him long. We know if he is scared because if he is startled he'll poop about 4 times in the same spot. And one time he bit me because I was holding a treat out and he went for the treat and missed it. I understand completely understand that he needs to get used to me and everyday we hold him, gently stroke him, or comb his fur to let him get used to us. Thank you for writing me back! Different chinchillas are going to behave differently to some degree. For the chinchilla that is biting, it could be because he is scared. What happens after the bite? Does he seem like he is trying to eat or does he jump and squirm as if trying to escape? If the former, then consider washing your hands as they probably smell edible. If the latter, then it could just be that the chinchilla needs to get used to being held just like your mother suspected. We just got two chinchillas 8 days ago and my chinchilla (Zazu) doesn't mind being held for some reason. I don't pick him up a lot because sometimes I feel heat coming from him. But my brother's chinchilla sometimes bites us when we pick him up. My mother told me to let him get used to us picking him up. Do you have any other advice? And our chinchillas love music, is this normal? Our chinchilla really don't get scared easily. Is this normal? That temperature should be good assuming humidity is kept low. Be aware that sunlight can make a room warmer. Sorry, but we don't know any breeders in that area. I'm hoping to get a chinchilla real soon! Our house his usually at 72-73 degrees. That should be fine, right? Do you know of any breeders in Wisconsin, or any place close to there like Illinois or Michigan? There are not really a lot of different breeds of chinchilla. But one that is most common is the dwarf chinchilla that looks like a cute little rabbit! Judging by the description of your friend's chinchilla, I have no idea what hers are! It might just be how their hair grows. All chinchilla are different. She might have a special dwarf chinchilla! I was wondering if there are different kinds of chinchilla breeds because my friend has 2 chinchillas that are really soft and fluffy but the chinchillas aren't fluffy. We don't know of any breeders in the southern Texas which certainly doesn't mean there aren't any. You're more likely to get a healthier chinchilla from a breeder than a pet store. Do you know of any breeders in southern Texas, because wouldn't it be better to buy a chinchilla from a breeder rather than a pet store? The temperatures you mentioned are in the upper range of what chinchillas can tolerate. All such temperatures may not kill them, they may be less inclined to run around and be social since moving around will cause them to warm up. You also need to consider the level of humidity because if it is also humid at those temperatures, your chinchillas will be even more uncomfortable. As for taking your chinchilla back and forth, that will probably cause it stress. Chinchillas don't like change. They're not at all like dogs that often like to explore new places. Plus, you'll have to worry about further temperature issues outside during transport. I'm getting my first chinchilla soon. We keep our house temp around 78-80 degrees F. Is this too hot? And is it okay if I take it back and forth with me each week from my mom's to my dad's house? Or will this cause too much stress on the chinchilla.